The holiday season will soon be upon us! With all the chaos that is sure to ensue, it’s important to keep the health and safety of your four legged family members, too. As you prepare your feasts and deck your halls, keep these thoughts in mind to ensure you and your furry companions have a safe and enjoyable holiday. Your pet is sure to have wanting eyes when he sees what is likely the largest holiday decoration in your home! Before decorating your tree, anchor it so there is no chance it will fall over and injure your pet. This will also prevent any of the water from spilling. 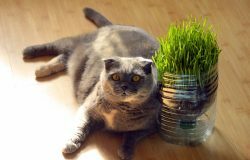 Fertilizers from the tree seep into that water and can cause tummy upset if your pet ingests it. Besides, stagnant water is a breeding ground for bacteria which will leave your pet with nausea or diarrhea. Those beautiful antique and breakable ornaments will look beautiful on your tree. Just place them high enough so that your curious friend won’t get to them. In addition to being upsetting to you, broken pieces can be ingested and lead to gastrointestinal problems for them. 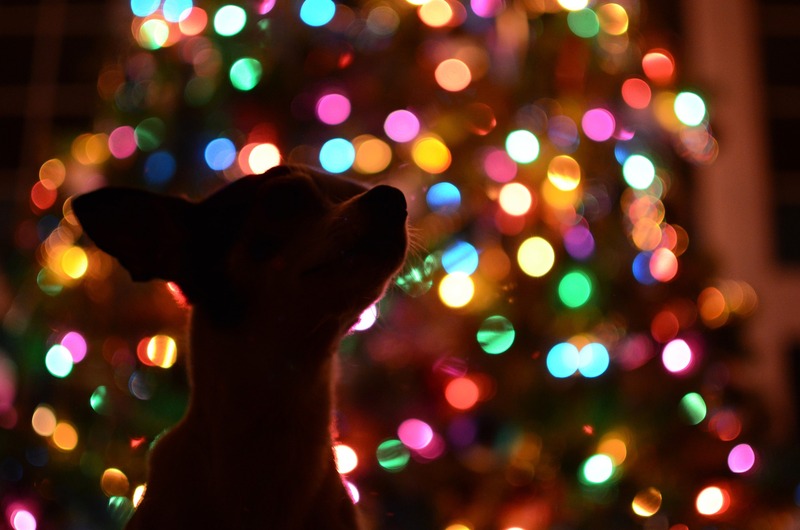 It’s sparkly and does add a bit of pizazz to a tree, but to your pet, it is often mistaken as a toy. 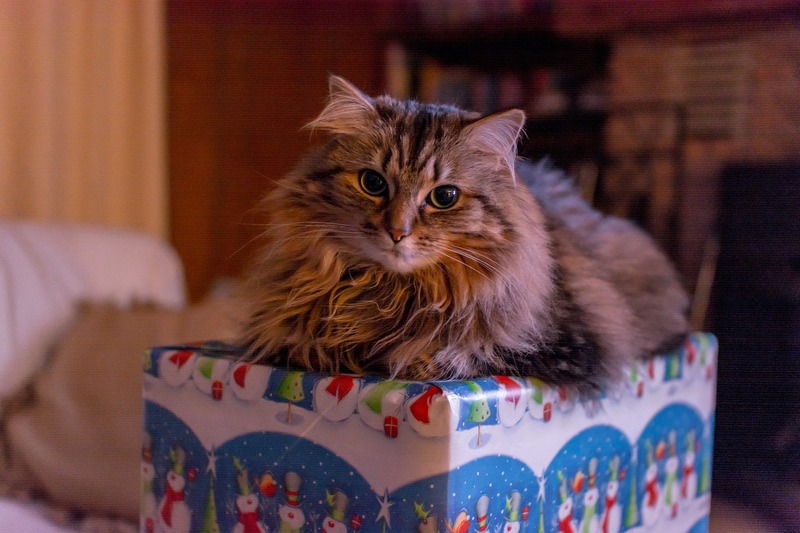 If swallowed, tinsel can obstruct your pet’s’ digestive tract leading to severe bouts of vomiting, dehydration or the need for a surgical procedure to remove it. No tree is complete without lights, but, do they really need to be on the lower part of the tree? Likely not. Wrap the upper parts of your tree with twinkling lights where your inquisitive pet can’t mistake the wires for a chew toy. 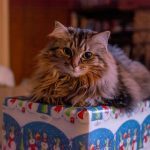 Candy canes and freshly strung popcorn and cranberries are certainly festive to the human eye but can cause serious tummy trouble for your pet. Go ahead and add a few peppermint canes and string up some corn, but use it on the higher portions of your evergreen. Food is an integral part of the holiday season for just about every culture. While you may be tempted to share the deliciousness with your pet, DON’T. Enjoy the merriment of a holiday cocktail with your human friends, not your furry ones. If you need to put your drink down, place it out of your pet’s reach. Alcohol can cause them to become weak and too much could put them into a coma. Fatty, spicy human foods – even the bones from your holiday bird or roast – should not be given to your pet. Ingesting these items can cause pancreatitis which could be life threatening. There are plenty of turkey and beef flavored foods designed specifically for pets and are a better, safe option. By now, you likely know that anything chocolate is a no-no, as are foods sweetened with the artificial sweetener, Xylitol. Indulge this season without sharing. If you don’t finish what’s on your plate, toss into a COVERED garbage can. Pets are smart and will wait for you to trash your uneaten treats. 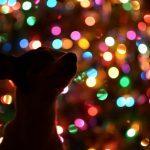 We don’t want to be all doom and gloom — after all, the holidays are supposed to be a joyful time, even for your canine and feline friends. Shower them with pet-friendly gifts! 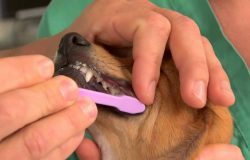 There are plenty of indestructible chew toys on the market your canine family members are sure to enjoy. Purchase ones that are large enough not be accidentally swallowed whole. Long, stringy toys are a feline’s dream and there are many varieties to choose from. A new scratching post is also a gift that any kitty will appreciate. Before the holidays arrive, make a note of your veterinarian’s contact information along with the number to a 24-hour animal hospital just in case you have a need. 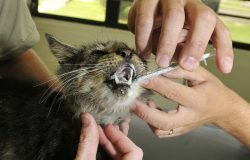 It is also a good idea to note the ASPCA Poison Control number which is 1-888-426-4435. While we hope you won’t need to use them, it is better to be prepared than frantically looking for them in an emergency. 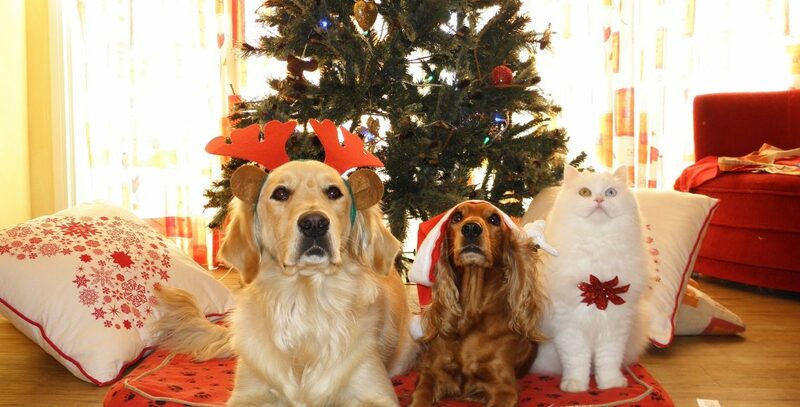 Wishing you and your pets a happy and safe holiday season!